Hahatonka Spring is the centerpiece for a karst complex. Recharge Area: Dry uplands and valleys to the south and east. The spring flows into the Niangua arm of Lake of the Ozarks. 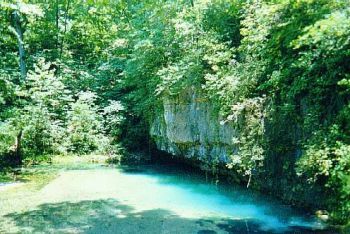 Interesting Information: Hahatonka Spring is the highlight of an intensely karst area featuring caves, natural bridges, tunnels, and sinks. Originally called Gunter Spring, it was renamed by a railroad promoter Robert Scott in the 1890s who, it is believed, invented an Indian legend about 'laughing waters' to go with it. Hahatonka Spring and nearby River Cave are connected, according to divers who investigated during the late 1980's. Brief History: The spring was first used around 1830 by a man named Garland, who established a gristmill on the branch. According to the WPA Guide to Missouri, R.M. Snyder began building his country estate at Hahatonka in 1905, importing 20 stonemasons from Scotland to work on his "castle" which overlooks the spring branch from a 200 foot bluff. Snyder was killed in an auto accident in Kansas City in 1906. The castle was eventually completed in 1922 by his son. The Snyder family sued Union Electric when their property was partially submerged by the closing of Bagnell Dam, but lost after an expensive proceeding. Use of the castle was relatively short lived, as it burned in 1942 as the result of a chimney fire while being used as a hotel. 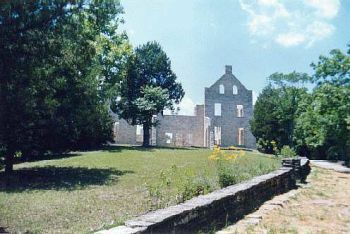 Although promoted as a potential national park area since the 19th century, the spring, castle ruins, and surrounding karst area was purchased in 1978 as a Missouri State Park. River Cave served briefly as a show cave, and now houses endangered bats. Ownership and Access: Owned by Missouri Division of State Parks. Some trails to spring and castle are quite steep and strenuous. Picnicking, fishing, hiking only, but no charge for entry to view the spring. Snyder's Castle ruins on the bluff above the spring. This page last updated on May 17, 2006. Return to Twenty Largest Springs Page. OR Return to Missouri Springs homepage.